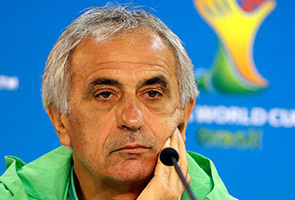 PORTO ALEGRE: Algeria coach Vahid Halilhodzic on Sunday turned on reporters repeatedly asking whether his players are observing Ramadan on the eve of their World Cup clash with Germany. Germany take on the Algerians in Porto Alegre on Monday in their last 16 clash, but repeated questions about the Muslim month of fasting drew the coach's wrath. "Stop asking me about Ramadan or I will get up and leave," fumed the Bosnia-born Halilhodzic as Ramadan started on Saturday. "This is not the first time I coach a team with Muslims, I'm a Muslim myself. "Unfortunately, I have read some newspapers, and one in particular, who continue to tarnish my image and question my honour and integrity," he fumed. "They have called for hatred and aggression against Vahid and his entourage, that's disgusting!" The clash at Porto Alegre's Beira-Rio Stadium has drawn plenty of questions about the 'Shame of Gijon' which remains a sore point in Algeria, three decades later. Despite beating West Germany 2-1 in their group games, Algeria was eliminated from the 1982 World Cup after the Germans played out a mutually beneficial 1-0 win over Austria in Gijon. "No one has forgotten what happened in 1982, the players will be motivated to get their revenge, but the Germans will also be doing everything to get to the quarter-finals," said Halilhodzic. A 1-1 draw against Russia in the group stages put Algeria in the knock-out phase and Halilhodzic said his side are dreaming of a place in Friday's quarter-final against either France or Nigeria in Rio de Janeiro. "We had a lot to lose against Russia, but we have nothing to lose against the Germans," said Halilhodzic. "We are living through good times and we want them to continue, we want to go to Rio to at least visit the Copacabana -- that would be nice. "The Germans are really impressive, they finish very well and are very fit. "I have talked to the players and tried to get the underdogs feeling out of them. "We'll prepare for this as if it is the most important match in our careers. "We will give it our upmost, but we will try and leave this wonderful tournament as well as possible."